Samford University’s annual disaster simulation, orchestrated by the College of Health Sciences’ Experiential Learning and Simulation Center, is a testament to the university’s dedication of empowering its students with confidence, compassion and knowledge to be leaders in their chosen field. 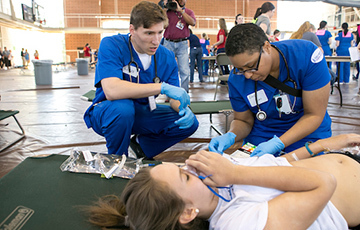 This year’s simulation will take place April 4 at Dawson Memorial Baptist Church, and will involve more than 350 students and employees from the college’s four schools—School of Health Professions, Ida Moffett School of Nursing, McWhorter School of Pharmacy and School of Public Health—as well as 10 community partners, bringing the total participation number to more than 400 people. The scenario—a natural gas fire in a dormitory—will determine the type of injuries and medical trauma the students will need to address and treat, but the simulation will not reenact the disaster. Instead, the focus will be on providing students with experience in emergency medical relief. Under the leadership of the Experiential Learning and Simulation Center, the simulation has grown in size and complexity since it began six years ago, and it will involve a record number of community partners. Many of the community partners are returning. The American Red Cross will provide materials for the setup for the relief center, and it will have employees on site to work with social work students in field assessment of emotional needs of patients. Northflight Aeromedical Services will land a helicopter, providing students the opportunity to simulate preparing a patient for transport. Regional Paramedic Services and Homewood Fire Department will work alongside Samford students and EMT students from Herzing College to triage and transport patients from the field. Homewood Police will assist with traffic control and road closures, and Jefferson County Emergency Management Agency and Jefferson County Health Department also will be on hand to help in consultation and debriefing. A new community partner this year is the Birmingham Baptist Association, which will be involved with its Feeding Unit. The Feeding Unit responds to disasters, and provides food and meals to relief workers and victims. Nutrition and dietetic students will work alongside them as the association will be generously providing lunch to employees and volunteers working to prepare the simulation. As employees and community partners prepare for the simulation, so do the students. Each participating student must complete an online course that provides learning objectives and explains the student’s role.